The magician hands out a deck of cards with a blue back to a spectator saying that it contains a prediction. The magician is so sure of his prediction that he also hands out an envelope with his prediction written “black on white”, inside. Next he pulls out an “invisible” deck. After some byplay, the spectator first selects a suit, and then with a completely free choice selects the value of his invisible card. Let’s say for example he chooses the six of diamonds. - The chosen card is the only one face up! - It is the only red backed card! - The other cards in the deck are ALL sevens of spades! An effect that will Knock Out your audiences! The effect is easy to perform. 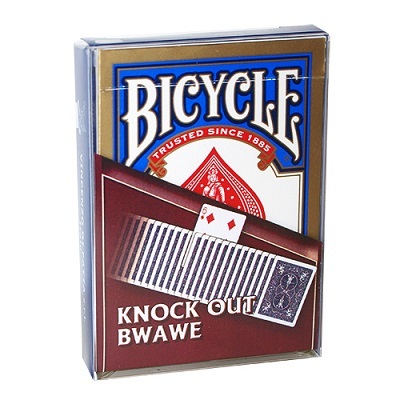 Supplied is the special Bicycle deck, and clear written instructions.